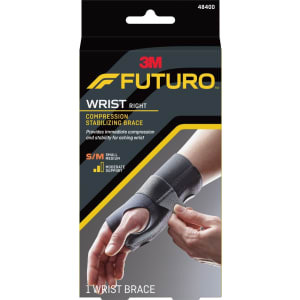 Futuro Compression Stabilizing Wrist Brace, Right Hand, S/M, Black from Target. igid support and compression. Featuring an easy-sleeve construction, this wrist brace is so easy to slip on and off, and soft materials help keep you comfortable all day. A gel-cushioned palm provides comfort, and the low-cut profile allows you to type and text with ease. Whether you're playing a pick-up game at the gym or catching up on e-mails at work, rely on the stabilizing support of the Futuro Compression Stabilizing Wrist Brace * Size: Left Hand - S/M, L/XL Right Hand - S/M, L/XL * Color: Black Age Group: Adult.